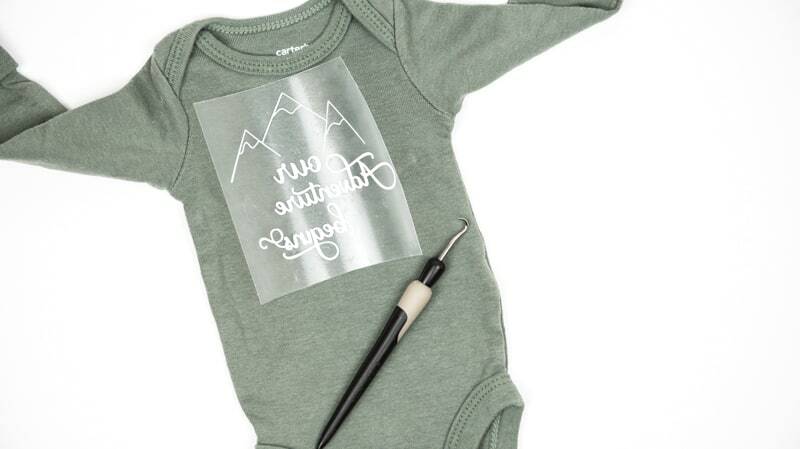 Make a sweet Coming Home Hospital Onesie for the newest addition to the family! When I was pregnant two years ago I couldn’t wait for my little one to come home in the outfit I designed for him (you can see it here). I made him a lot of onesies while I anxiously waited to meet him, it helped pass the time and it was a great stress reliever for me. Because we all know how stressful pregnancy can be! With the new year here I know quite a few babies that are arriving soon! I’m so excited for everyone I know that is having a little one, and I can’t wait to shower those babies with sweet homemade gifts. 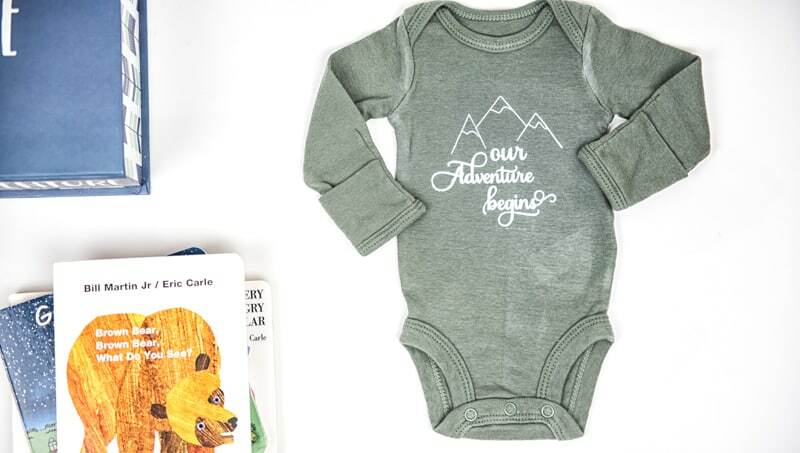 And because I truly believe that every newborn should look cute and stylish from the moment they leave the hospital, this coming home hospital onesie will definitely be in the mama-to-be’s gift basket! This post contains affiliate links, meaning that if you make a purchase after clicking through Simply Made Fun may receive a small commission at no extra cost to you. Thank you for helping support my crafting habit! Nothing can quite describe that euphoric feeling you get when the baby finally gets to come home with you. I remember being so elated (and scared out of my mind) as we drove away from the hospital. Our little guy barely cried in the NICU, but once we got home he showed us that he had a pair of lungs and wasn’t afraid to use them! Parenthood quickly went from, “Oh sweet baby we’re so glad you’re here” to “holy cow, this just got real”. I truly believe that nothing can prepare you for being a first time parent. You hear stories from family and friends, you think you’ll be able to handle it, and then those sleepless nights hit and you realize that you have to learn your babies cues just like they have to learn about you. Parenthood is truly an adventure. One that is spectacular, hard, gratifying, and incredibly worthwhile; but testing you all the same. You will never learn more about yourself and your partner than you do in the first few months. Your adventure to parenthood starts the moment you see two lines on the little stick, but it doesn’t truly begin until you have that little bundle of joy here with you. 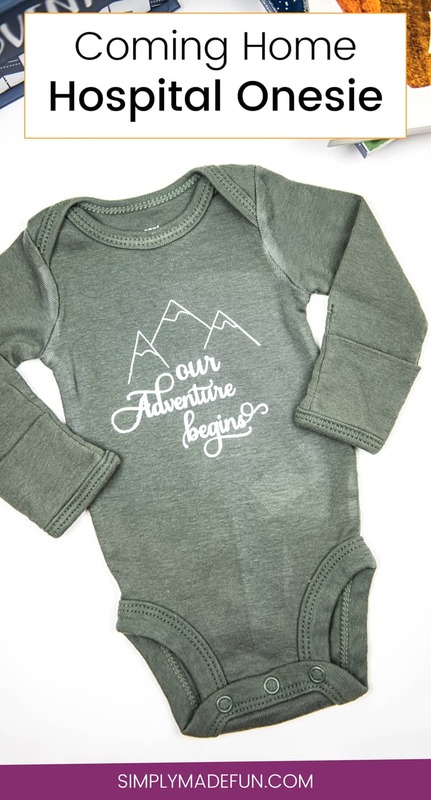 That’s why I made this Adventure Begins onesie for all the new parents out there. You’re about to go for the ride of your life! Want to make your own Coming Home Hospital Onesie? PRO TIP: Always make sure that your design is mirrored BEFORE cutting it out! You want it to look backwards until you go to place it on your onesie. + Cut out your FREE Adventure Begins design and weed the vinyl. Set it aside. + Warm up your iron and iron out the onesie. Fold the onesie in half and iron the crease. This will help you center your design when you go to place it on your onesie. + Measure an inch down from the collar and place your Adventure Awaits design down on your onesie. Look at it and make sure that your design now reads the right way! This is important, do this BEFORE you iron it on. + Cover the design with your pillowcase or teflon sheet and press (hard) on your design. Do this for 45-60 seconds and then peel up the teflon sheet (or pillowcase). If you notice that some of your design hasn’t stuck to the onesie, put your cover back on the design and press again for another 45-60 seconds. Keep doing this until your design sticks! This coming home hospital onesie is so sweet and I love how it turned out. It’ll be the perfect gift for all of the mommies-to-be that I know! Do you know anyone having a baby this year? Would you gift them this Coming Home Hospital Onesie? Grab Your FREE Online Silhouette Suppliers Guide! Check out more Heat Transfer Vinyl Projects to try! That is such an adorable onesie, and the perfect outfit for anytime after coming home too! I would love to know where and what vinyl you purchased for this project. The link for it doesn’t seem to be working. Would you mind letting me know the details? Thanks so much! I can’t wait to try this! Hi Christi! Thank you so much for bringing that to my attention. I bought the vinyl from Expressions Vinyl, the link in the post should be working now so that you can order it from the same vendor. As long as you buy heat transfer vinyl you can make the same project! Where is this specific onesie from? I love the color of it? Thanks! Hi Wren! I believe I bought it at Target years ago. I’m not 100% sure though!